John Wesley's fifth visitation of Cornwall, in 1847, saw him spend little more than a week in West Penwith. On Tuesday 7th July he arrived in St Ives where he preached before moving on to Stithians the next day. The 9th was given over to organisational matters with the stewards of the Methodist Societies, ensuring that they were on the right course with suitable people at the helm. After Gulval Cross on Friday 10th he moved on to St Just where he again gave time over to organisation, examining all the local classes but also preaching on both Saturday 11th and, at 5am, on Sunday 12th. Following his early shift at St Just he moved on and at noon preached to the “the largest congregation I ever saw at Morvah”. After Morvah he preached at Zennor, after attending service in the church, when his congregation gathered below the churchyard wall. Much of Wesley's travelling was done on foot but in this case he was on horseback, by 5pm on Sunday 12th he was in Newlyn. In twelve hours he had preached in St Just, Morvah, Zennor and Newlyn; Sunday was not a day of rest for John Wesley. This was Wesley's first visit to Newlyn, as he tells it: “An immense multitude of people was gathered together, but their voice was as the roaring of the sea.” He addressed this host from “rising ground, near the sea-shore, where was smooth white sand to stand on”, and as he spoke the crowd became quiet. But the quiet mood was interrupted by “some poor wretches of Penzance” intent on breaking up the meeting. Wesley was thrown to the ground, only to be rescued by a Newlyn man, Peter Jaco who he describes as “a bitter opposer till then”. It seems he might have been saved by the antipathy between Newlyn and Penzance. The Newlyn people allowed him to finish his sermon without interruption. Peter Jaco himself went on become a Wesleyan preacher, a brief account of his experiences can be found on the Weekly Wesley blog. Tolcarne by Capt. 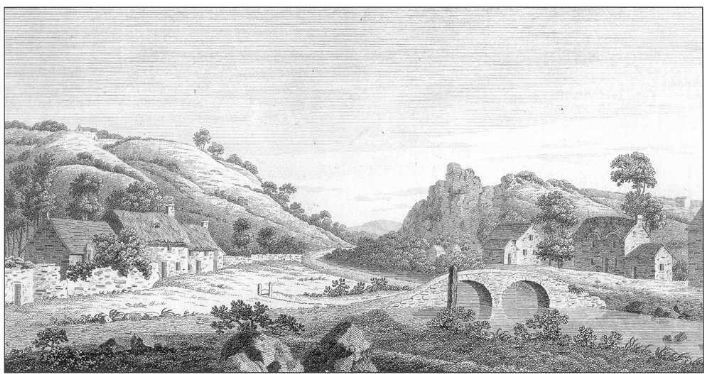 Henry Pendarves Tremenheere, showing Newlyn Bridge and to the right of it a small house identified as Wesley's first preaching house in Newlyn. The location of Wesley's first preaching in Newlyn has been identified as Tolcarne and an article in Eighteenth Century Life in West Cornwall by Pam Lomax identifies the preaching house built on the site of Wesley's first public foray into Newlyn life. Wesley's itineraries record 14 visits to Newlyn over the years but it was not until his fourth visit in 1751 that he found a ready welcome from the people. The weather in 1751 was less welcoming, he records that he preached in a hailstorm. Whatever your view of Wesley's purpose you can't help admiring the man's energy and persistence. He certainly did what are often called today the hard yards, or in his case the hard miles. His persistence and enthusiasm was obviously taken up by his followers for by 1876, almost 100 years after Wesley's death, there were 28 Wesleyan Methodist Circuits in Cornwall and in those circuits a total of 23656 members and 385 preaching places and chapels which could accommodate 100,290 Cornish Wesleyans. John Wesley & R. Symons, The Rev. John Wesley's Ministerial Itineraries in Cornwall, Symons, Truro, 1879. The book is available as a facsimile reproduction from Gyan Books. To get an insight into life in Cornwall in Wesley's time have a look at Eighteenth Century Life in West Cornwall, Penwith local History Group, 2014.